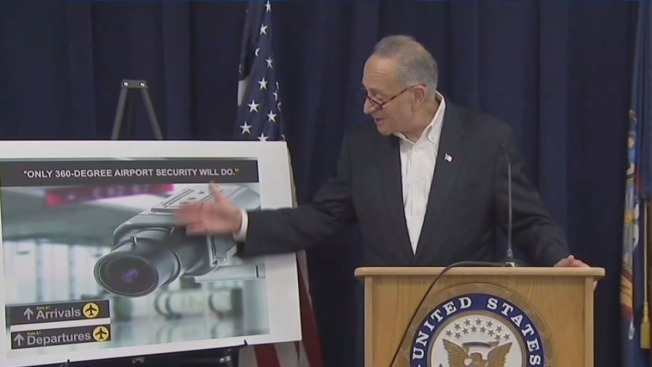 U.S. Sen. Charles Schumer is asking federal officials to review airports in the New York City area after an I-Team investigation showed surveillance blind spots at Newark Liberty International Airport and LaGuardia Airport. Schumer is calling for the Department of Homeland Security to determine if the airports have vulnerabilities after the I-Team investigation showed security cameras inside baggage areas and near doors and pick up and drop off at both facilities do not have comprehensive video surveillance. Schumer said a review of security at all airports around New York City will help authorities fix any security lapses. He added that all problems uncovered through the reviews must immediately be addressed. The surveillance isn't mandated. Homeland Security offers recommendations to individual airports on security, but the tools and procedures by which security is implemented are at the discretion of the individual airports and their operators, according to security expert Manny Gomez of MG Security Services. The Port Authority of New York did not immediately respond to a request for comment, but chief security officer Thomas Belfiore said at the time of the I-Team report "thousands of closed-circuit security cameras strategically placed in operation across all our facilities, including our airports, and we are continuing to expand our coverage and use of security cameras in existing areas and in new projects." "We continue to work with the TSA to ensure maximum camera coverage in critical areas of our airport facilities," Belfiore said.